I’ve had enough of people complaining about winter. Yeah, it’s frequently freezing (or topsy-turvy warm and wet) and you just lost your left glove again, but there’s still plenty to do. In fact, I think Columbus is a pretty stellar place to survive winter, and I’m prepared to prove it. I acknowledge the obvious: Los Gauchos makes a mean taco al pastor. This little taco — made with succulent slow-roasted pork and flick of pineapple — got big press a few years ago when it landed on the Food Channel as one of the top tacos in the country—and you can get it for half off on Monday nights at both Los Gauchos locations. So why skip taco night this winter? Because Wednesday is $2 gringas night, and I think it’s way better. Winter benefit: You’re warm from the salsa…not from being wedged in a taco line. Sundays are free days at the Columbus Museum of Art — and even if you don’t aspire to be Michelangelo yourself, viewing the pieces in the museum is a worthy way to spend a winter afternoon. CMA boasts a fine collection, including works by such greats as Mary Cassatt, Paul Cezanne, Pablo Picasso, and Agnes Martin, and hosts traveling exhibitions on a regular basis. Winter benefit: Something to look at that isn’t the television. Sure, the Gateway Film Center plays your normal Hollywood crackerjacks. And, yes, from the outside it looks like a normal theater. But, actually, it’s also the kind of theater that hosts a twelve showing marathon of Groundhog Day, and plays 2001: A Space Odyssey in 30 mm film, and screens documentaries that no one has heard of except your neighbor with a handlebar mustache. In other words, it’s great. So go see an odd movie, dammit. Tickets are five bucks all day on Tuesdays and include free popcorn and, we presume, an unlimited pass to the drinking fountain. Winter benefit: You’re watching a movie and you’re not freezing to death. What more do you want? In my humble opinion, Highbanks is the shining jewel among Columbus Metro Parks. It’s full of ravines and winding paths and hills just steep enough that pretending you’re in optimal physical shape might be a little more trouble than usual. It’s also completely overrun on beautiful weekend days. But you’re in luck, because it’s winter, it’s snowy, it’s freaking cold, and no one wants to go to Highbanks in such dreadful weather. Except you. Because on a lonely weekday when the snow is falling, being completely alone in the woods of Highbanks is an experience not to be missed. Trust me. Winter benefit: An actual experience of actual winter. Bundle up, Buttercup. They’ve prettied up the Columbus Metropolitan Library headquarters, and, boy, is it shiny. It’s also a pretty good escape in the wintertime. Thanks to the attached garage, parking is super cheap and a breeze, and, unless you take a wrong turn of epic proportions, you will encounter absolutely no freezing, wintry substances on your walk inside. Once inside, the big reading room feels airy and vast, with room to stretch and breathe — it’s a good antidote to winter claustrophobia. And you don’t actually have to read there, of course. Take any quiet project, a puzzle, or a computer with headphones. Electric outlets are plentiful. Plus, there’s an attached coffee shop and a hall that rotates art exhibitions. Plus, it’s a place that’s not your house. Winter benefit: Didn’t you always say you’d read War and Peace someday? What do you think? 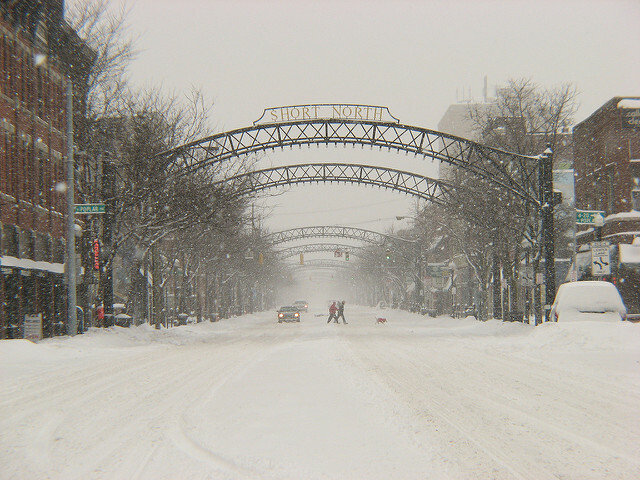 Do you have any secret wintery spots that you want to share with the rest of Columbus? Comment below! For more of Nelle Smith’s work, you can visit her website/portfolio.